It was rather late in the fall when Bob and I went for a walk at Lynde Shores Conservation Area in Whitby, but glorious sunshine made for an unseasonably warm day. 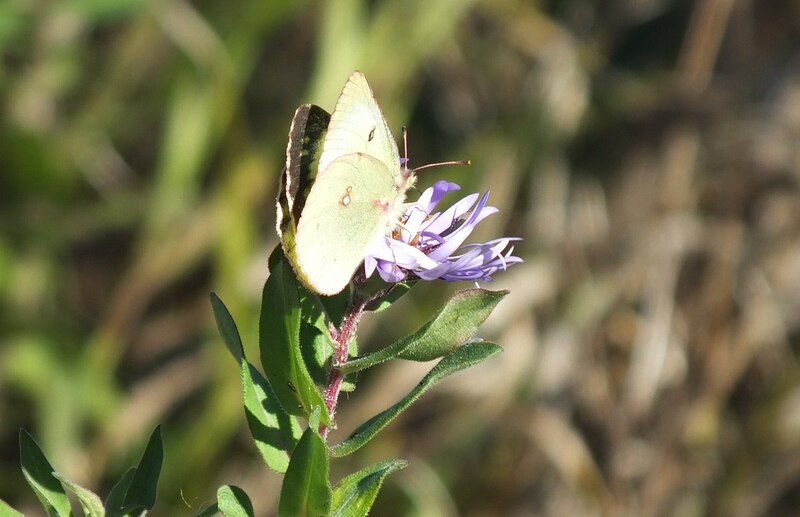 It was no surprise, then, to find numerous butterflies visiting the remaining wildflowers in the meadows within sight of Lake Ontario, butterflies such as this Clouded Sulphur (Colias philodice). 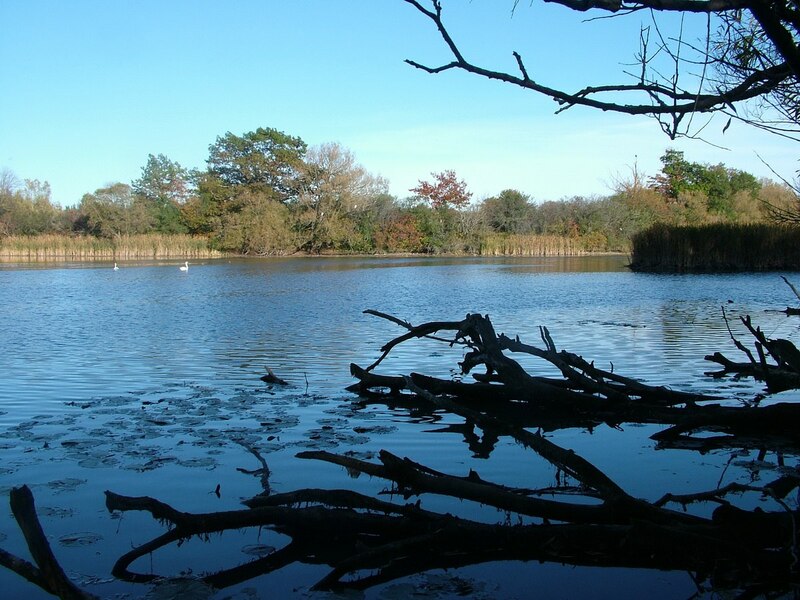 Lynde Shores Conservation Area encompasses an area with a diversity of habitats…forest, lakeshore, meadows and Lynde Creek Marsh, which combine to attract a variety of animals and birdlife. It was when Bob and I emerged into the meadow lands from the evergreens at the edge of the forest that we were bathed in warm sunshine, and consequently found much bird and insect activity. A light breeze ruffled the dry grasses, but otherwise a peaceful calm enveloped the area. 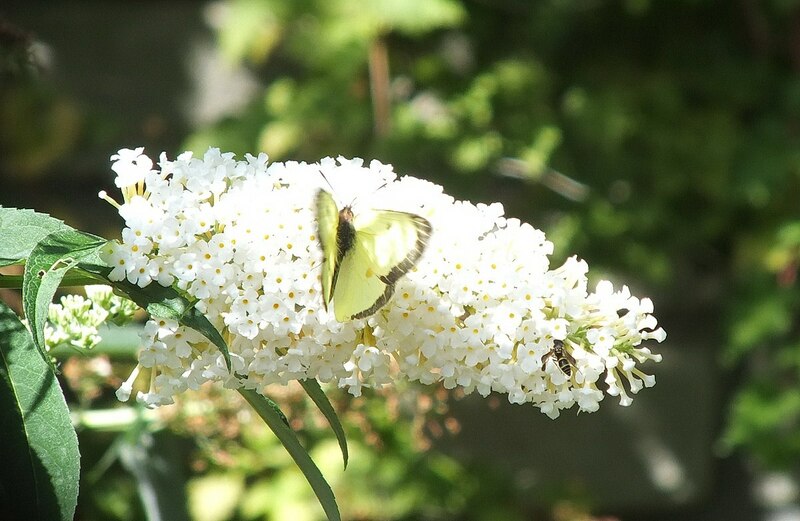 At first, when we spotted a couple of butterflies, we thought we were seeing something new to us. 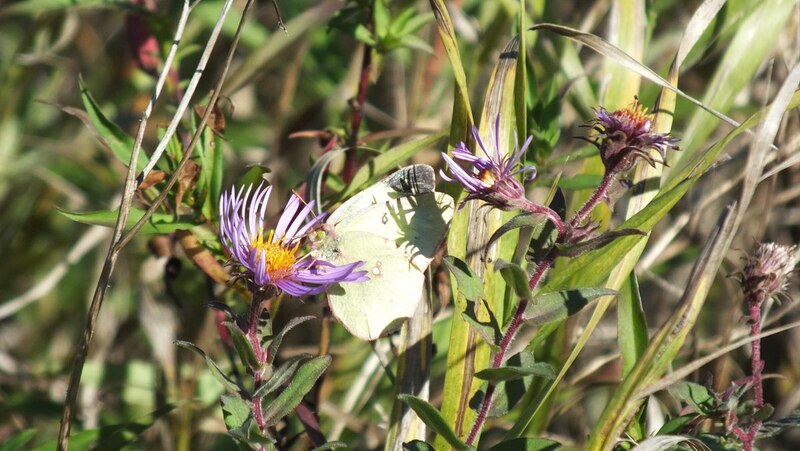 As they flitted from flower to flower, their wings appeared to be a citrus-orange colour, but once they lit on the wild Asters, the ventral view revealed a pale yellowish-green set of wings set off by a double spot on the hind wings. This silver spot was encircled with pink. 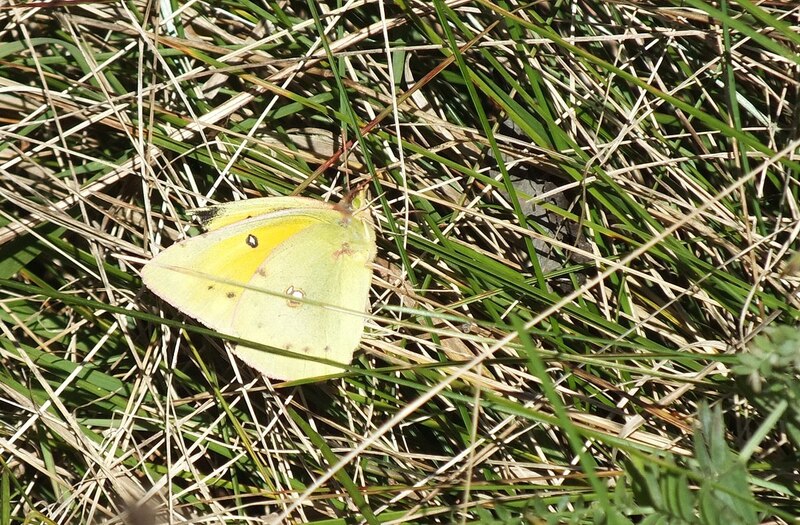 That is when we recognized the butterfly as a Clouded Sulphur. 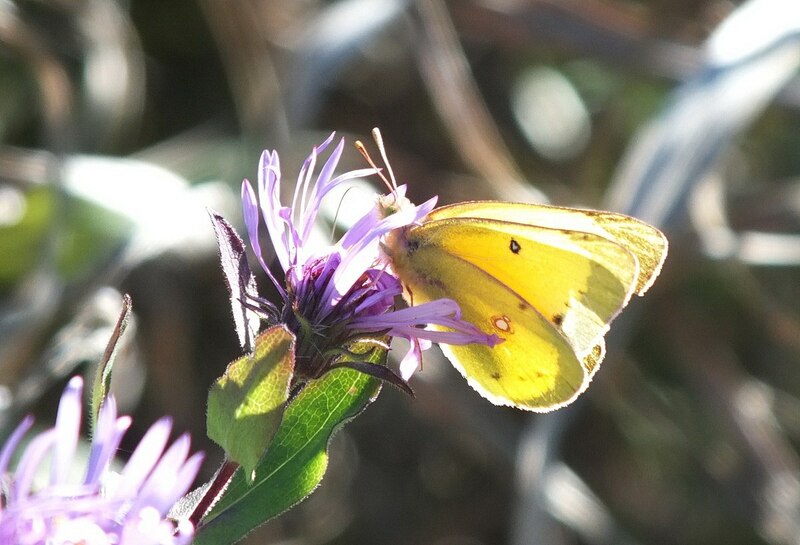 Clouded Sulphur Butterflies drink nectar from a variety of flowers…goldenrod, milkweed, dandelions and thistles…as well as asters, which were the predominant flowers blooming that late in the season. 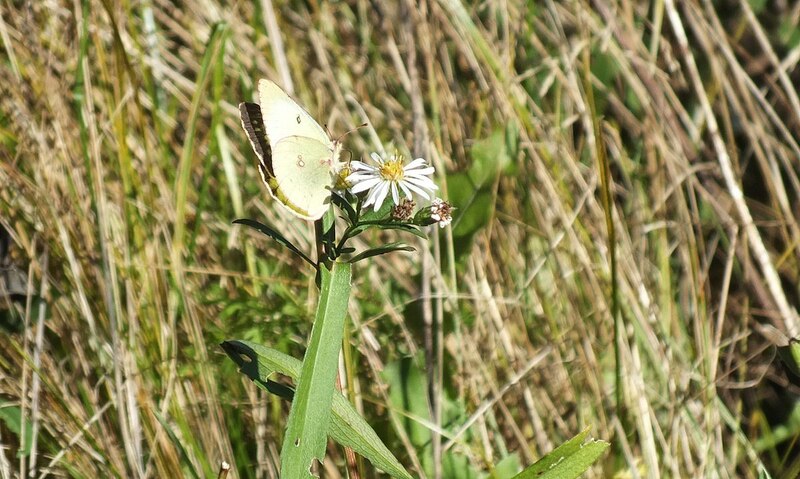 From the sneak peak at the top of this butterfly’s wings, I would hazard a guess that it is a female judging by the yellowish spots inside the black border edging the forward wing. 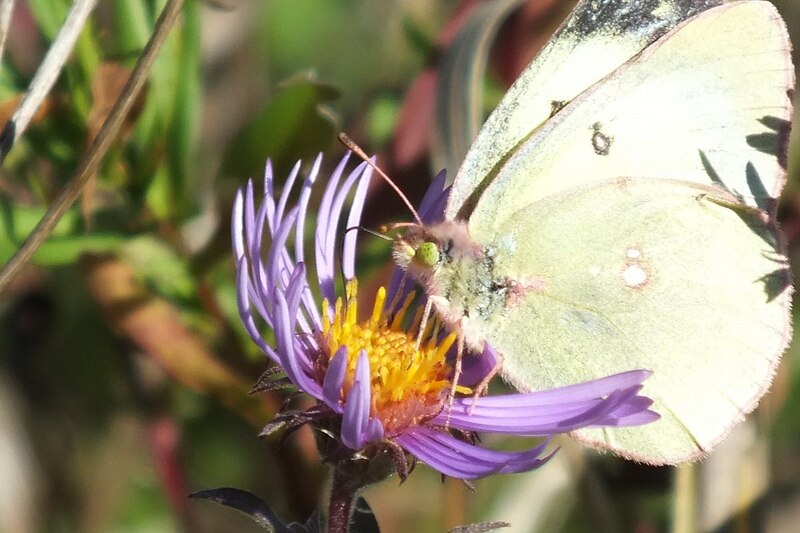 This Clouded Sulphur Butterfly that Bob and I saw at Rosetta McClain Garden in Scarborough earlier this fall shows off the male’s wings with a sharp black border. The black spot on the fore wings is also visible, as well as the pale orange spot on the hind wing. and at one point, one of the butterflies simply floated to the warm bed of dried grasses and lay there soaking up the sun. 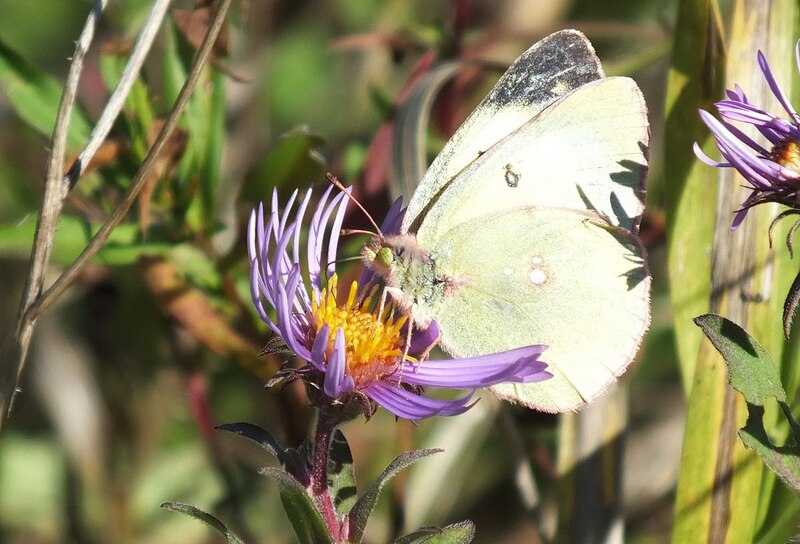 Clouded Sulphur Butterflies are delicate little gems, with a wingspan of between 1.5-2.75 inches. As they danced on the undulating breeze, Bob and I were almost spinning in circles with cameras in hand, in our vain attempts to keep up with their fast-moving charades. The air sparkled with their bright yellow movements.